Hi, bloggers. Today brings post #8 in my How to Blog Party series, which is written for new and experienced bloggers...lots of tips and tricks for joining and hosting a blog/link party. You can click here to start at the beginning of the series and see a round-up of all the posts so far. Last week, we talked about how to add a button to your blog post as a form of linking back. 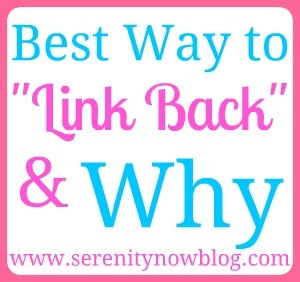 This week's topic is: What's the Best Way to "Link Back" and Why Should I Do It? Forgive the length of this post, but I really wanted to share with you all the reasons why linking back is so important. Other bloggers like to talk about it behind-the-scenes, but it's not often tackled head-on in a post. I'm not writing this to shake my finger at anyone or to come across as a cranky hostess, but I have been frustrated over the past year or so with link parties and have thought about ways we can improve things. I've seen bloggers fret and complain about "who makes these blogger etiquette rules anyways?!" The honest truth is while there are no hard and fast rules to the blogosphere, there are basic guidelines. We observe guidelines because they make the blogosphere a nicer place to be. Bloggers who have been around for some time care about setting standards. It's no different for any other aspect of life...the "pioneers" forge the way for the rest of us! Today we'll explore why taking the time to add a link back directly to your blog party posts is important. I realize that this is a pretty hot topic and can stir up some conflicting opinions. I write this post from the point of view of someone who joins various link parties weekly and hosts one weekly. After several years of experience and lots and lots of discussion with bloggers far more successful than I am, I felt like it was time to write this. What is the best form of linking back to a blog party? Simply put, the absolute best way to link back to a blog party is to insert a text link directly into the post you are adding to the blog party. We talked about how to add a text link back to your posts earlier in the series, and I mentioned that it's easiest to just quickly add them to the end of the post you'll be linking up. This is pretty much guaranteed to endear you to blog party hostesses everywhere. Can you pick out the correct text link back? If you picked C, you were correct. A is okay, but really...if you're going to link to someone, why not just include the blog name and give that person credit? We'll get to the futility of link party pages later in the post. In their most basic form, blog parties are a form of Quid Pro Quo. "I scratch your back, you scratch mine." I'm hosting your link about a DIY Toilet Paper Caddy from here to eternity, sending future readers your way each time they click on your thumbnail. In return, I ask you to place a simple "I'm linking to Serenity Now" text link or something like that at the bottom of the post you are sharing. I send readers your way, you send some my way so they can find similar posts from the party. Why is a text link back in my post so important? Why can't I just direct readers to my "link party page" on my blog? I am not very knowledgeable on SEO (Search Engine Optimization), but I did some research online after some of the (much, much bigger) bloggers noted that this is an important factor in link parties and link backs. I'll share some links to online articles about SEO at the end of this post. Basically, what I've learned from articles and more experienced bloggers is that Search Engines look to see who you are linking directly to (ie. all those thumbnails on my site for my weekly party). When the Search Engine sees that a large percentage of those specific posts do not contain a link back to my site (within the post URL! ), it can be bad. For me and you! If you're confused, Google "do follow links." From what I understand, SEO is why text links are better than including a blog button in your post. I try to include a direct link to the party's specific URL when I can, but from what I understand, a text link to the hosting blog's homepage will also suffice. If SEO isn't enough to make you want to link back within your post, then consider #2 on the list. Several years ago, when I started blogging, link parties were a new thing and there weren't a lot of them. It was just expected that if you joined one, you read the hostess' guidelines and linked back out of respect for her and the work she did to put the party together. Somewhere along the line, parties began to pop up everywhere and bloggers started linking their posts up to any party they might come across without linking back. You'd see the same craft post at 15 different blog parties, but no mention of those parties from the blogger. She was getting tons of traffic from these parties and growing her blog, but neglected to give credit to the sources of that traffic. Everyone seems to be in such a rush to be the next famous blogger that they aren't stopping to take a breath and remember their fellow bloggers. Sure, link party pages are great if a reader wants to browse and find a fun new site to follow. It's a nice service to provide for visitors, but it doesn't help blog party hostesses. My Analytics have never shown me any noticeable traffic that corresponded from a blogger's link party page/sidebar to my blog party. I've noticed bloggers saying, "But the party link/button on my sidebar or link party page is there forever. I'm directing my readers to you that way." -You write a really cool post about Chocolate Cake and link it to my party. You have my party button on your Link Party page, but you don't add a text link back to me within your post. -Suzy Reader loves your post about Chocolate Cake and wants to know where to find other cool posts like this one because she sees your "Linking to These Parties" link at the bottom of your post. -So you get an extra click on your site when Suzy Reader clicks over to your Link Party Page. -She sees about 85 blog party buttons, all piled together in one big jumble. -The probability that Suzy Reader will see my blog party button, click on it, go to my blog, and then browse pages of my blog to find the party you linked Chocolate Cake up to is very very small. -And again, don't forget the SEO!! 4. What have you got to lose? Yes, it does take time to add a text link at the bottom of your posts when you link them up. But responsible linking can also earn you Features. You're much more likely to get extra traffic from a blog party feature, as opposed to just adding your link and then moving on to the next party. If you are too busy to edit your post and add a quick link back, then you might need to consider if you are linking to too many parties. Anything worth doing well will take time, so why not go the extra step and be rewarded for it? 5. Hostesses can't be hypocrites! Hostesses who ask readers to link back should follow their own rules. I often have bloggers who host their own parties (and have much bigger sites than me) link up. With no link back. Yet they require the same thing from their readers. That's unfair and (in my honest opinion) pretty disrespectful, particularly when you are knowingly adding your post to a party with set guidelines for link backs. In that same thread, hostesses who ask for link backs should encourage the practice by offering an incentive like a Feature on the blog, Facebook, Pinterest, or even Twitter! Why do party hostesses care so much about me adding a link back into my post? What's the big deal? It's not a big deal when it happens a few times. But when you spend hours hosting a party each week, it's frustrating when it continues to happen on a large scale. It's not the end of the world and hostesses don't think about it all day, but it sure can put a hiccup in the way your party grows. It is a lot of work to put together a link party, whether you host it weekly, monthly, or even just occasionally. As we launch into the how-tos of hosting over the next few weeks, you will see that hosting a blog party is so, so much more than just pasting some code in your blog's html and watching the links pile up. As stated above, a blogger puts her site's SEO on the line when she hosts a party. When numerous participants neglect to link back to her site within the post(s) they add to her party, it can be damaging. People who are serious about growing their blog, their party, and their readership care about things like this. You can't grow a party easily when half of the participants don't bother to let their readers know where they're linking up! Many hostesses are invested financially in their blog parties. It costs money to use a linking service (like inlinkz). Even if it's not a lot of money, I have to pull from money I've earned writing articles or finding sponsorships to pay for the service. To help promote both of us! Some hostesses are so frustrated with the lack of follow-through that they've edited their party codes to only accept posts that can detect a link back embedded within the post. Others (myself included) add a note to their parties alerting readers that they only feature posts with a link back in the post. I can't tell you how many awesome posts I pass by every week because I don't see a link back within the post. I know it can be easy to forget when you're in a hurry, but some bloggers link up week after week...with no link back. I hate passing those posts by for a Feature, but I also want to be fair to the readers and bloggers who take the time to read and follow my guidelines. I know many other hostesses feel the same way. To sum up, I know some of you will continue to keep your link backs on your link party pages. Or not link back at all. Is it the end of the world? Absolutely not? Is it the end for party hostesses everywhere? No! But it certainly would make the blogosphere a better place if we all considered those around us, reading guidelines before linking up, and offering credit to the blogs hosting our links and sending traffic our way. Next week, we'll talk about choosing a photo for your link up thumbnail. Great post! I am still fairly new to blogging so I do not know all of the "blogger etiquette" rules. I have a linky party page but rarely link back IN my post. Thank you for bring that to my attention! I will definitely start doing that! I didn't even think about that affecting SEO! Good post and series, Amanda! I find the idea of linking (here) to be insane and the idea of link pages to be lazy. If you are too lazy to include the hostess link on your post, you don't have time to link up to start with. I'm also very glad you mentioned the idea of hostesses being hypocrites. When I do Dare to DIY in the winter, I'm always amazed by the bloggers who don't link back, particularly those who have link parties themselves and know better. I don't participate much anymore in link parties, because I just don't have the time to really get the most out of them. But, I'm happy you are approaching this subject. One more question - what do you think about adding a link to an older post that fits the link party criteria? There are sometimes I think I have a post in the past few weeks that would fit, but I'm not sure proper protocol for adding this to the link party and editing the post to add the hostess link back. I don't blog, just read, but I really enjoy this series, because as an avid blog reader (whose clicks help the bloggers I read) I pay attention to who gives credit to the hostess as well. And thanks again for those features Amanda! Those posts are always full of great ideas, as is your Pintrest. It's so appreciated! Wow what a great post! I link up to many parties and just have a link party page I honestly thought that was a good thing to have. But, hearing how it doesn't help the hostess I will definitely be changing that. I want to help the hostess as much as they're helping me by providing the link party. I also had no idea it costs money to use services for the link parties. Such an eye opener! Great post Amanda! You really broke the whole concept down to an easy to understand level & I even learned a few more things about linking back. :-) Thanks for taking the time to work on this series! Thank you for clearing a lot of things up. I've always added a button if provided because they look purdy. :) But I'll start adding the direct link instead- had no idea it made any difference! Great post! I am learning step by step all the behind the scenes thanks to you. I think it is only common courtesy to help the hostess of the link party as much as possible! And here I am rambling. All that to say... thanks for being a great host, for educating bloggers and for sticking up for your standards! SEO is something I know very little about and I'll be sure to check out the articles you suggest. I like that some party hosts have their pages set up so that someone who doesn't have a link-back in their post can't participate. "Linking to these parties" or "I party here" seems lazy to me because the link isn't to the party itself, just to the blog. I think it's a good thing that some party hosts aren't featuring bloggers who don't follow the rules. Amanda, this series is just amazing, and I think this article may be the best yet. You know that I started a new party this spring. I like this in many ways, but the truth is it IS a lot of work to host a party (and I'm not even a very good host, to tell the truth!). But I like my subject, I think it's worth the time, and I want to be an encouragement to others. So it's a huge help to me when others do provide a link back. You're right--it's not the end of the world when they don't. But I do appreciate it very much. I really, really like the point you make about unfairness. I know, of course, that some blogs are so big that their owners can't begin to keep up with all emails, etc. But I've actually stopped reading one blog whose owner made it clear that there were certain ways she'd treat bigger bloggers and other ways she'd treat smaller bloggers. I decided that her blog wasn't worth my time, either, not even for "networking" purposes. I appreciate your honesty!! I'm just hosting my first ever link party and I've found your tips very helpful. Love your party every week and I'm pretty sure I've been linking correctly. Your features have really helped bring traffic to my blog, so I am very appreciative! Hi Amanda - WOW!! What a great and well written post! I love that you took the initiative to write that....I have noticed in the past few months that there are also 2 additional 'problems' lurking in bloggy land - and it is frustrating the heck out of me...and its people who just link and run at a linky party...they don't visit any other links (as advised to do in the party rules! )they are just in a hurry to promote their own blogs then hit the next linky party. I can't tell you how many parties I visit and also visit a couple of others each time I link up, while others just don't. This is very frustrating, when you take blogging very seriously, like me, and are striving to grow your blog, and put such a great deal of effort into it. As well, I find it frustrating when I follow a blogger that hosts a party or even another blogger that I have found thru link parties, I leave a nice comment and compliment their blog, informing them I am their newest follower and to please visit my blog and follow me back if they would like to keep in touch....and they don't visit, don't leave a comment and don't follow me back! It's all quite discouraging sometimes. I am a believer that this is a community to build friendships and help each other out (as well as doing something I love for me). I even visit a lot of blogs that leave 'no reply blogger' comments to notify them of the problem and tell them how they can fix their settings...sometimes I feel that there is a real lack of blogging ettiquette and 'esprit de corps', I actually feel like its getting worse! P.S. I list the blog name of every party I attend in each post as well as having a party page...I agree with what you said here completely! I like this post, you are very intuitive for a non-SEO expert. :) I like what you said about linking to parties at the bottom of your post, and you are right, text links more important than image links in a lot of cases. I'm going to change how I link up. Just an FYI, in terms of SEO, link parties help the blogger who is hosting them in a couple of ways, it attracts traffic to that persons' blog and, more important, it causes people to link to the host blog in a FOLLOW link. What the linky tool does is it posts URLs through a PHP script that follow the link tool, but not the URL of the person posting their link. In plain words, when the search engine indexes the site it ignores all of the links posted in the tool. This is huge in terms of organic search. However, it helps in that those blogs get more exposure and possibly more traffic, which is why I link up. That a good reason for me NOT to host a linky party. I'd be so annoyed at people not linking back! I love that you said I'll scratch your back, you scratch mine. Well said! Great post Amanda! I always love your blogging series, they are always so honest and informative!! Can't wait to see what you come up with next. Have a fun Memorial Day weekend with the family. Thank you! There are always bloggers who many not know and new bloggers coming along so repeating the rules, or "guidelines" is necessary and appreciated I think. Great post, Amanda! You made some really good points. I always link back with a blog button. Guess I need to change to a text link though. I am learning so much today. I've been on these blog websites and they all want me to put their button on my website. I do because, well, they said to, but I'm not really sure why or how it is helping. I like the link back idea and the link party. I can actually SEE it. I would LOVE for you to write more about SEO and break all of that down the way you have with the link party topic. Like SEO for Dummies. Count me in as a reader! On the upside hostesses do get lots of traffic from thier parties, TONS if it's successful whether someone links back to your page on their post or not, right? Hi, "Anonymous." As I said above, it's not a matter of traffic...it's really about SEO. I receive lots of traffic from certain link parties I join, and I also get a fair amount of traffic from the parties I host. *However*, many many of those bloggers "link and leave." I might get one click from them when they add their link, but they'll most likely get more than than from various readers going to explore their site. And to add to that, I'm hosting their link forever--so there is the potential for them to get multiple clicks months from now. Regardless of traffic, link parties should absolutely be beneficial to both parties and the right thing to do is to read a hostess' guidelines and link back the way he/she has requested. Or don't join at all. Awesome post and fantastic information!! Thank you! I am new to blogging and parties, have done a few in the last couple months, and you are saying don't use their button. I don't know how to use the button html they provide so I save the button picture to a folder, insert it to my post, and link the party hyper-link. Is this ok? Or should I be linking the text name as you say? You make some really good points. I'm going to change the way I link up. thank you. Amanda...all I can say is THANK YOU!!! This is great information! Definitely pinning to help educate all of us! I really like how you spelled all of it out, and your point about quid pro quo reminded me why it's important to link to each party on each post. There are so many generous bloggers that host these link parties, and they deserve something for it. We gotta stick together & support each other. I will certainly continue linking back on each post. Thanks for sharing your blogging wisdom! Thank you for this! We didn't understand and now we do! We vow to put a link back on every blog post we share on a party. Great post, I just jumped over here from the link on your link party this week. It's so important! Good reminder about SEO. I keep a draft post with the parties I link up to regularly and copy and paste into my posts. I look at it a couple times a month and adjust for new parties or those that I don't link up to anymore. Ok, back to your party so I can mingle! Thanks.